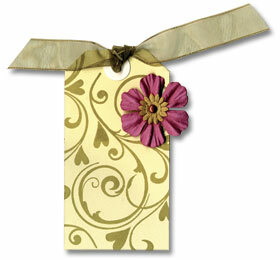 This tag is so elegant and easy to create, you’ll want to stamp several to have on hand for gift giving. Stamp the Heart Flourish image in green ink on a Cream Notecard. Punch a hole at the top of the tag and add a white circle. Tie a ribbon and add Art Flowers with a brad. Layering our Art Flowers is so much fun! Try using the beautiful Vintage Collage or Pastel Collage varieties on this tag. Dad won’t be able to resist feeling special when he receives this unique card. The resist technique featured is relatively simple but packs a big punch. Cut a piece of cream paper and round corners. Stamp flourish with Versamark and clear heat emboss. Rub various Distress Inks over the embossing, blending completely. Stamp greeting with brown ink on ledger paper. Round corners and rub edges with Distress Ink. Stamp wood grain with green ink on green notecard. Assemble as shown. Add buttons and stitching. Use tissue to wipe ink from embossed area if necessary. Stamp directly on patterned paper, or on acetate over patterned paper. Stamp the CardArt Thinking of You image in Black StazOn Ink on an Acetate Card. Alternatively, stamp it on the paper listed in the next step and adhere the acetate over the top of the stamped piece. Trim and mount over patterned paper. Mount onto a White Notecard. Add Yellow Gemstones. 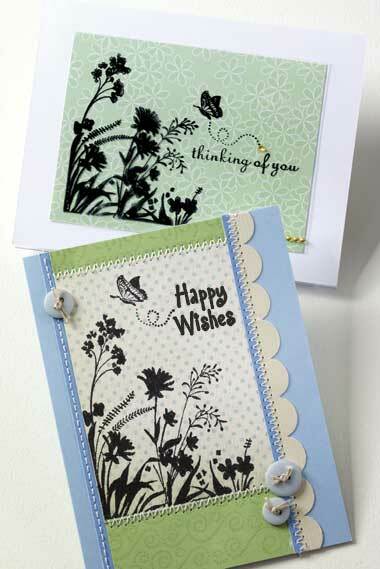 Stamp the CardArt Happy Wishes image with Black Ink on soft patterned paper. Trim and adhere to a Baby Blue Notecard. Cut strips of lightly patterned paper. Adhere above and below the CardArt stamped piece. Add blue strips and scallop edge (cut out of a Cream Notecard). Add Card Buttons with string. Create your own patterned paper! For the strips on the Happy Wishes card, take a Lime Notecard, stamp the F4784 Swirly Dot Border repeatedly with Bamboo Ink. 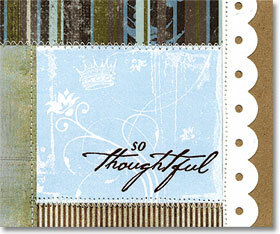 For the Thinking of You card, stamp a pattern of flowers using any flower stamp or a flower background. Use your leftover scrapbooking paper underneath the clear acetate or above and below the happy wishes card for a subtle pattern. 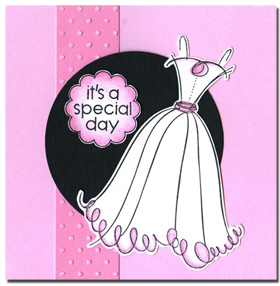 Create a simple and elegant card that’s fit for a princess! Stamp the Fancy Dress image in black ink on a Blossom Notecard. Shade with color pencils. Cut out and add Assorted Crystal Gemstones, Small Accent Pearls, sequins and a bow. 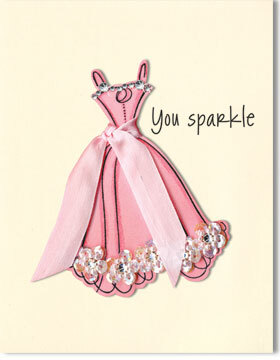 Stamp the “You sparkle” message froom the You Sparkle set in black ink on a Cream Notecard. Mount the dress piece with foam tape. Imagine this dress stamped on white and adorned with pearls and a bit of tulle — here comes the bride! Use your favorite papers along with new collage stamps to make patchwork cards. Basic Grey and Bazzill Scallop Edge Papers. Stamp the message with brown ink. Cut pieces of pattern paper and affix to a Kraft notecard framing the stamped image. Cut a strip of scallop edge paper and affix to the card. Use a pin and white pen to make faux stitching if a machine is not available. Let your creativity loose. Stamp and embellish colorful circles to your heart’s content. 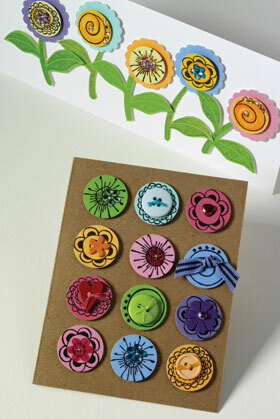 Use them as design elements on a card or as fun flower centers! Stamp the flower images from the Pop Art Design set in black ink on various colors of notecards. Shade with color pencils. Punch out circles. Punch out scallops in coordinating and mount onto a Long Notecard in White. Stamp the stem and leaf portion of the Cutout Flower image in green ink on a Green Apple Notecard. Cut out. Arrange the “garden” of flowers with foam tape. Add Gemstones and Sparkle Gems Blossoms. Stamp all Pop Art designs in black ink on various colors of Notecards. Punch out with a circle punch. Add embellishments Card Buttons, brads, Gemstones, Sparkle Gems, etc.) and arrange in a pleasing fashion. Once you start decorating circles you won’t want to stop, so why not make a set of these notecards to give as a gift? Create simple elegance with two wonderfully detailed stamps. Cut strips from a Kraft Notecard and assorted pattern paper. Affix to an Okra Notecard. Machine stitch as desired. 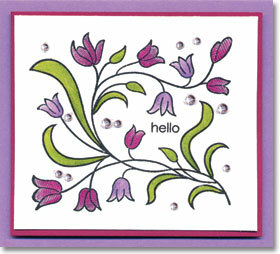 Stamp the Scallop Flourish image with Soft Pool ink onto a White Notecard and cut out. 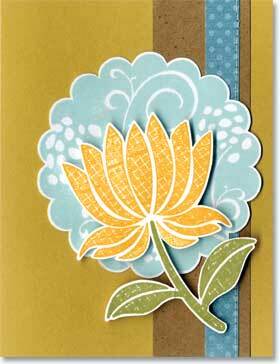 Stamp the Cutout Flower image with gold and olive pastel ink onto a White Notecard and cut out. 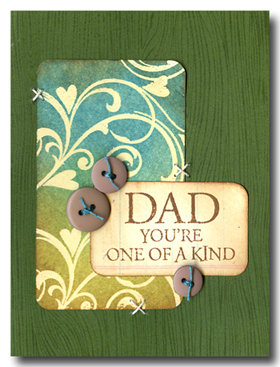 Mount the scallop and flower pieces to the card. Ink the stem of the flower first, wiping off any green ink from the flower petals before inking with yellow. Accent a colorful card with matching gems. Stamp the French Country image with black ink on a White Notecard. Add the “hello” greeting from the All Occasion Messages set to the center. Color with pencils. Trim and mat on a Dark Cherry Notecard and trim. Add to a Wisteria Notecard and trim off excess. Color over the flowers with a clear glitter pen. If you don’t have a glitter pen, add sparkle with Stickles. Try making this card in various color combinations. The possibilities are endless. Precious baby photos and a playful owl image pair up on this perfectly adorable page. The Girl Owl can be dressed for any occasion! Cut photos and adhere to right of page. Cut a strip of yellow cardstock 7″ long, round top corners. Adhere above photos. Cut a rectangle from green cardstock, stamp with raindrop background and adhere next to photos. Cut another small strip of yellow cardstock, round bottom corners and adhere below photos. Cut a small strip of white cardstock with scallop scissors and adhere over top of yellow cardstock. Machine stitch. Stamp woodgrain on kraft paper and adhere a strip of it across green cardstock. Stamp owl on white cardstock, color. Stamp owl on patterned paper, cut out and layer over colored owl. Cut out and adhere to page with flowers on hat and dress. Place pearls in centers of flowers. Scatter pearls around owl. Stamp sentiment onto white cardstock, cut into a circle. Mount onto a yellow cardstock circle, adhere to page and machine stitch. Stamp a woodgrain stamp image onto kraft cardstock with ArtPrint Brown ink for a realistic look!